Acclaimed by press and public for grace, precision, expression and eloquence in communication, Rajyashree has in her dance career spanning more than four decades presented innumerous solo performances, workshops, lectures, lecture-performances, radio/TV and newspaper interviews worldwide. Enhanced by her association with international artists and interaction with several cultures, her dance and choreographic signature is multidimensional in approach. Some of her signature solo productions include: "Goethe's Iphigenie" with actress Erika Eller, "Snapshots of Feminity" with musicians Laura Patchen and Mila Morgenstern, "Cosmic Body" based on Indian cosmology and Laban/Bartenieff Movement Studies. 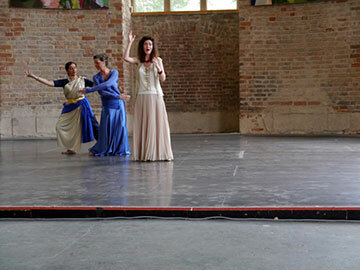 As a recipient of various state grants in Berlin for her innovative choreographic ideas, she has since 1995 presented several stage productions and commissioned work that range from classical to innovative multinational, multidisciplinary and cross-cultural ventures with world dance forms and movement disciplines under the label of Rasika Dance Ensemble and later Rasika Dance Theatre International (See http://www.rr-dance.net/en/productions.html for a complete list of productions).